"The look of lacquer is indeed lustrous; cinnabar reds, brown blacks, deep greens, ochre yellows, each color absorbed in depth and richness. The decoration is as wondrous and varied as the lacquer objects themselves." Yoshi Hayashi was born in Japan, where he grew up watching and learning the rigorous techniques of Japanese lacquer art from his father. 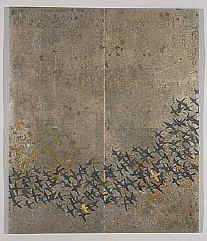 He has made the technique his own by using oil paints, resin varnishes, bronzing powders, and metallic leaf (gold, silver, aluminum, copper and Dutch metal) in place of the traditional Japanese lacquer. Hayashi layers one coat of paint on top of another, from opaque to translucency. He rubs and polishes through the many layers, uncovering some of the color and texture that's been buried deep in the surface. The subsequent application of acid transfoms the metals, subduing their harshness and enriching their patina.